The peculiarity of the construction of the Post and Bim house in the architecture of the beams and pillars, which are not hidden behind the finishing materials. In the interior, a heater is used, which fills the space between adjacent beams, and a stone or tree is laid over the top, cutting the materials directly into the poles. Inside the walls are also laid electrical cables, pipes and other important elements. Houses Post and Beam are quite light compared to other types of structures. They do not give a strong shrinkage, so often under them is carried out a shallow foundation. An exception can only be a soft soil of high humidity. Thus, the horizontal arrangement of logs contributes to the acceleration of construction. Depending on the dimensions and complexity of the design, the installation goes away from 10 days, after which the house is ready for decoration. A key role in the construction and further operation of the structure is played by the quality of the tree. For example, in Canada, traditionally log houses Post & Beam are erected from cedar, as it is resistant to decay, and also has an attractive shade. In Russia, the most common type of wood when building a house is the pine. It is an advantageous, environmentally friendly material that is resistant to moisture, drying out and pests because of the resin content. 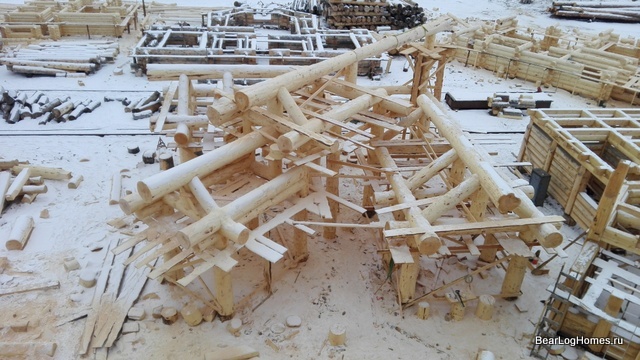 Technology of erecting a house in the company Bear Log - good dlomak from cedar is known, and consists in using internal chopped joints of beams and pillars, as well as screeds and bolts on wood. Despite the rather similar technology of building houses, there can be significant differences in their design, which reflects the price of the Post & Beam house. "Canadian bowl", in which the technology of creating nodes is similar to the previous one, but the form of cutting is trapezoidal. The simplest method of nodal junction is considered to be a "round bowl", and the most reliable one is the "Saddle notch". In addition to the different methods of erection, the junction connections have distinct architectural designs, so you can order a Post and Beam house with a unique interior. The advantage of the buildings is wide possibilities for internal planning, which do not require bearing walls. Houses of the Post & Beam type - a relatively new direction in the domestic construction market, but tested by practice in Europe and Canada. Apply to create a unique home!